Excellent quality. The top drawer with the outlet and USB ports is great for keeping our devices charged. The drawer lining is very nice. The bottom drawer holds a lot, and the middle drawer really is hidden. So happy with this purchase. 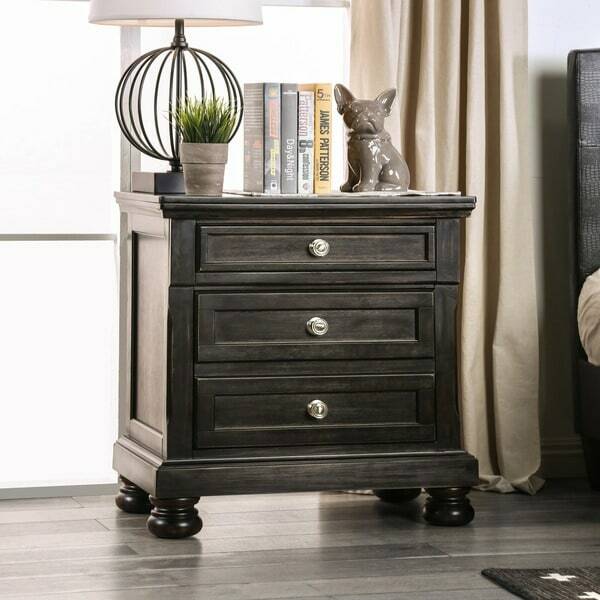 The rich wood tones of the Antique Black finish and the contrasting silver-tone handles are a chic take on a traditional nightstand for a look that is classically beautiful. Molded trim details and ornate bun feet are elegant touches that add a whole new level of sophistication to bring the most ordinary bedroom up a notch. Dimensions 29.0 In. X 18.0 In. X 30.0 In. "Can we return it in case we dont like the bed? "